Louisiana in the spring brings the blooming azaleas, beautiful mild days and an urge to get out of the city and into the country. Last week Karen and I met Kaye in St. Francisville for some lunch and retail therapy. Kaye is from there and was the perfect tour guide for some unique spots. St. Francisville is a plantation town, but we were not interested in touring any on this day. We were more interested in food and spending our green. Kaye and her daughter, Shannon, met us at Magnolia Cafe near the center of town on Commerce Street. The Mag, as it is called by the locals, specializes in original Louisiana cooking. The original Mag was in a building that formerly housed a service station. That building burned to the ground a few years ago and the owners relocated behind the burned-out spot. The facade (and the interiors) are very rustic. 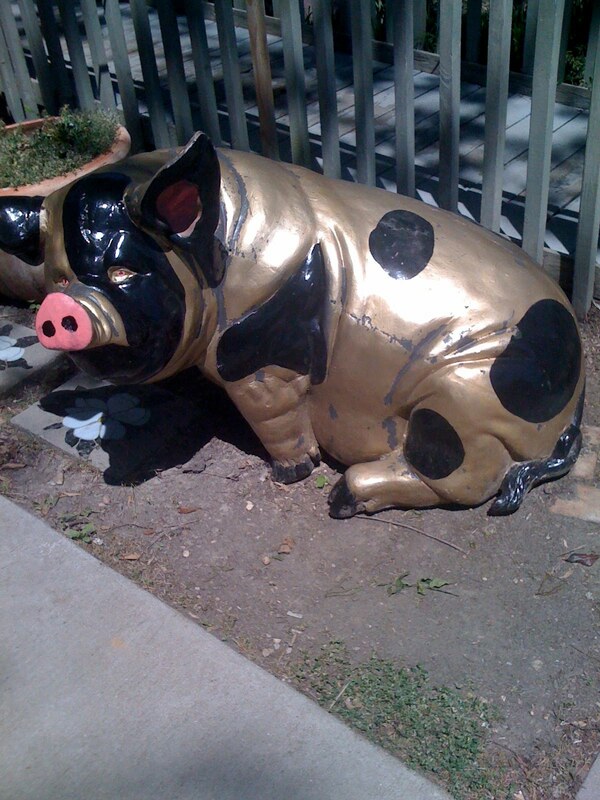 I was intrigued by the large golden pig statuary that greeted us as we approached the steps to the main dining room. It was such a pretty day that we decided to eat on the screened porch. There were ceiling fans whirring and it appeared that the heaters are lit in colder weather. The porch is used year round. There was one empty table and we snatched it up. The Mag is a very popular lunch spot. It is also a very popular night spot. I have been to the Mag before on a Friday night. That's the time when there is live music on the porch. What fun that is! My favorite band that I have heard there is Feliciana. A friend of mine, Bob, is the lead singer and always dedicates a song to me. How neat! I love to sample poboy sandwiches when I eat lunch out. The Mag has a soup and sandwich combination that was perfect for a lunchtime appetite. I chose the shrimp and squash soup and a half Santa Fe Sandwich. Even though the Mag specializes in Louisiana recipes, they have a sprinkling of Texmex items from which to select. I have had their Taco Salad before and it is super! The Santa Fe sandwich is toasted with turkey, Monterrey Jack cheese and bacon. It was very satisfying. The soup was a take on the ever popular shrimp and corn variety, but instead of corn there were slices of yellow squash blended with the creamy tomato base. The other people at the table tried the Quesadillas with chicken and the Magnolia BLT on wheat toast. The food was not complicated, but the taste was superb. Our waitress was excellent and kept the iced tea glasses filled. She was not perturbed by our request for separate checks, either. Good food, good company and good service made for a pleasant experience. Shanty Too was our next stop. 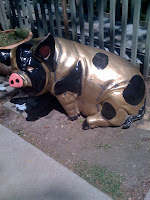 It is also located in the Historic District on Ferdinand Street. 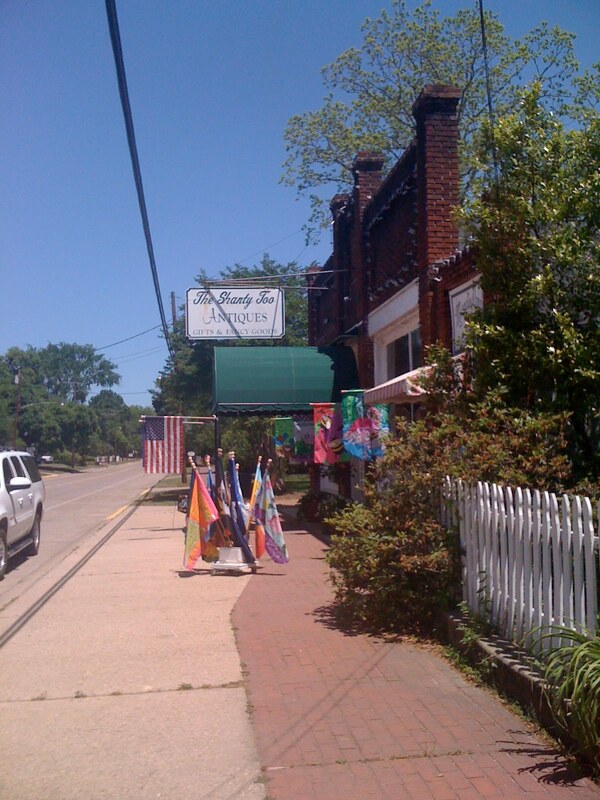 Shanty Too's owner told me they had been in business for twenty years. They carry a huge selection of gifts for babies, children and women. They also have some clothing, shoes and accessories. My daughter collects egg plates and I was able to get a really unique one there. Kaye knew the owners and we had a great chat while there. I found out they are open on Sunday afternoons, so am planning to go back one weekend to browse again. The highlight of the day was our final stop: Kaye's house! Kaye lives in an area deep in Audubon country called The Bluffs. We drove through a heavily forested area to reach it. The area has a golf course and is very secluded and is a lovely setting for homes. 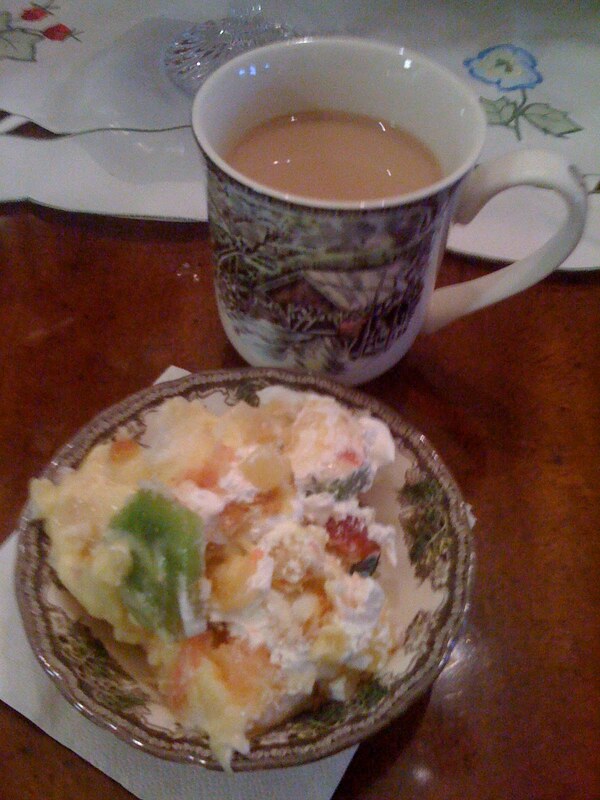 Coffee and English Trifle awaited us. As we enjoyed our refreshments, we were also served a taste of Irish Cream liqueur. Kaye's grandmother had a tradition of having a small sip of liqueur with her afternoon coffee, so the tradition was passed down to us on our visit. Good tradition, if you ask me! Kaye shared her trifle recipe with me and I am sharing it with you. I hope to be able to visit St. Francisville again and again. There is so much history there dating to pre-Civil War times. Look for more posts on the topic. Maybe next time I will visit a historical site and leave the shopping off.....or then again, maybe not! In a medium bowl, blend the sour cream and pudding mix into the whipped topping. Cut the cake into thirds, horizontally. Line a large trifle or other glass serving bowl with kiwi and strawberry slices, reserving two whole strawberries and two kiwi slices. Place one layer of cake in bottom of bowl, top with 1/3 of bananas and pineapple, and 1/3 of whipped topping mixture. Repeat layering until all ingredients are used. Refrigerate until ready to serve. Garnish with reserved fruit. Kaye told me that she pours Grand Marnier over the cake before assembling the trifle. Will definitely try that!